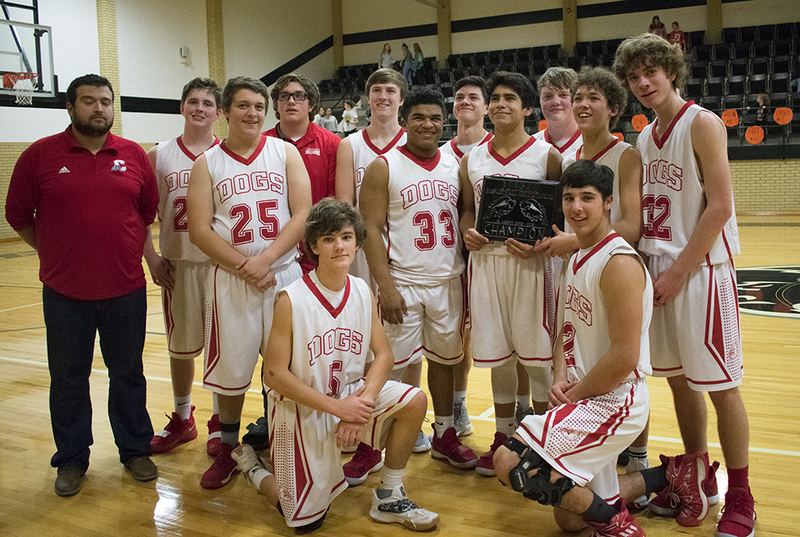 FORSAN — The winner for the Forsan JV Tournament championship game came down to the fourth quarter as the Bulldogs pulled ahead by 8 points over the Christoval Cougars to walk away with the title Saturday. The 31-23 victory left Coahoma 3-0 overall in the tournament. The game was a low-scoring affair for the first three quarters with both teams keeping within a point or two of each other. By the half, the Cougars had the upper hand by only 1 point, 9-8. Heading into the fourth, the tables had turned with the Bulldogs ahead 13-14. Seth Brooks jump started the Bulldogs’ offense by nailing a 3-point shot to pull ahead of the Cougars once more. Garrett Anderson and Isaiah Martin added 4 more points before Christoval could answer back. D’Kota Harrison, Avery Burgans, Sean Striegler, and Martin helped to salt away the game at the free throw line. Coahoma: Avery Burgans 2, Isaiah Martin 8, Seth Brooks 4, Colin Daniels 2, Sean Striegler 3, N. Dials 2, Tony Haggins 5, D’Kota Harrison 3, Garrett Anderson 2. Christoval — Woodfin 5, Walker 2, Workman 4, Jolly 5, Shriver 2, Wilcox 5. Free Throws — Christoval 11-19, Coahoma 7-18; Three-Point Goals — Bulldogs 2 (Brooks, Haggins); Team Fouls — Christoval 20, Coahoma 18. D’Kota Harrison netted 9 points and Isaiah Martin and Colin Daniels added 7 each in the Bulldog 43-29 win over tournament host Forsan Buffaloes Saturday morning. The Bulldogs built a 10-point lead by the half over the Buffaloes, but in the third quarter Forsan put on the pressure and outscored the Dogs by 2 points. However, Coahoma surged back late in the fourth for the win and a place in the championship game. Coahoma — Avery Burgans 2, Isaiah Martin 7, Seth Brooks 2, Collin Daniels 7, Sean Striegler 5, N. Dials 1, Tony Haggins 6, D’Kota Harrison 9, Isaac Murillo 2, Garrett Anderson 2 . Forsan — Valdez 9, Cervantes 1, Stallings 1, Richardson 6, Stockton 6, Hillfer 2, Hill 2, T. Moorman 2. Free Throws — Coahoma 10-24, Forsan 10-30; Three-Point Goals — Coahoma 3 (Haggins 2, Daniels), Forsan 3 (Richardson 2, Valdez); Total Fouls — Coahoma 20, Forsan 17. Game 1, Thursday, Jan. 10. Avery Burgans had a game high of 12 points to lead the Bulldogs JV to a 54-10 victory over the Garden City Bearcats during their first game of the Forsan tournament. Teammate Isaiah Martin followed with 7. A. Gutierrez, Isaac Murillo, and Garrett Anderson had 6 points each to help secure the win. Coahoma — Avery Burgans 12, Isaiah Martin 7, Seth Brooks 2, Collin Daniels 3, Sean Striegler 2, N. Dials 5, Tony Haggins 2, A. Gutierrez 6, D’Kota Harrison 3, Isaac Murillo 6, Garrett Anderson 6 . Garden City — N. Lara 5; L. Lara 2; Charranza 3. Free Throws — Coahoma 4-12, Garden City 3- 5; Three-Point Goals — Garden City 1 (N. Lara); Total Fouls — Coahoma 11, Garden City 6.